For over 35 years, I have had the distinct privilege to speak into women’s lives. It is my passion. Whether teaching, speaking at seminars or life coaching, I have loved encouraging women to be all they can be for God’s purpose in the earth. My heartbeat is for women to value their worth and significance, to dream, and to discover and pursue their God-given dreams and destinies. The greatest satisfaction that I have being a life coach is to experience many “ah-ha” moments or “light bulb” moments with my clients and students. It is really the “yes” or “wow” factor for me! It is exciting to come alongside women as they change their thinking and begin to walk in greater confidence and fulfillment. When I am not coaching or training, I always enjoy a good cup of coffee or a nice dinner with friends, working in my garden, or a nice weekend get-away to the beach – one of my favorite places! My husband Daryl and I are both certified life coaches and coach trainers (for the past 12 years). We co-founded Life Breakthrough Coaching & Academy, which, in addition to this site, produces a network of websites including LifeBreakthroughCoaching.com, and BiblicalCoachingAlliance.com. Locally, I serve as a speaker/trainer for a transitional program by the North Carolina Correctional Center for Women; a speaker/trainer for the Women’s Summer Empowerment Camps; and as a workshop presenter for various churches, businesses and events. 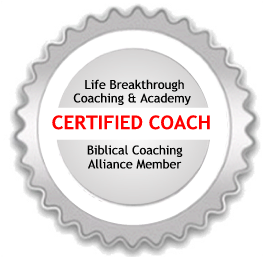 I also am the co-founder of the Biblical Coaching Alliance, which is a network of hundreds of Christian Life Coaches in over 40 countries.